This photo of Maidstone & District Leyland Panther No S99 reg JKK 199E with Willowbrook B45F bodywork was new in April 1967 prior to the renumbering to 3099 so was probably taken in the summer of that year outside Southdown’s Pevensey Road bus station. M&D had I believe ninety five Panthers the first sixty had Willowbrook B45F bodies (S26-S40 and S61-S110) and the remainder had Strachans bodies of either B45D (3111-3120) or B48F (3121-3140) layout. The 190 route was part of the joint Southdown/M&D Heathfield cycle a complicated but effective group of six interworked services, a thorough explanation of this working can be found in the Southdown Enthusiasts Club book called "Working Together". Hants & Dorset/Wilts & Dorset had some of these wished upon them during the reshuffling of fleets under the early years of NBC, DKE.C and JKK.E batches. JKK 203E even managed to gain Tilling red! I have a bought view of her thus at Basingstoke. Further to Pete’s comment they were more of a curse than a wish. A nightmare to keep on the road mechanically, hated by most of the crews. Give me an RE or Leopard any day. 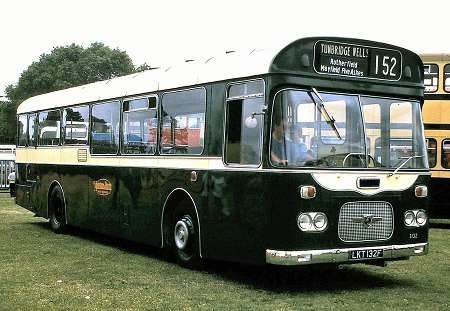 The ex King Alfred trio on H&D benefited from having the 680 engine but were still not the most reliable buses. Steve, I think it’s probably true to say that, if H&D/W&D had been BET operators, they would have stayed well away, as I belief Southdown did. Incidentally, does anyone know why some fleets suffered this ‘asset stripping’ by having vehicles transferred out? Was it that the recipients were deemed to be short of suitable vehicles? 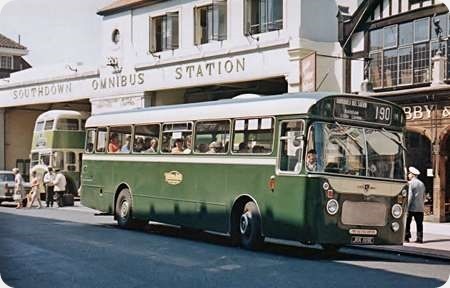 Hants & Dorset’s problem (one of them, at least) in the early 1970s was that they had not purchased enough single deck buses in the late 1950s and early ’60s. Such vehicles would have been suitable for OPO, but H&D had purchased mainly Lodekkas plus 6 coaches per year. 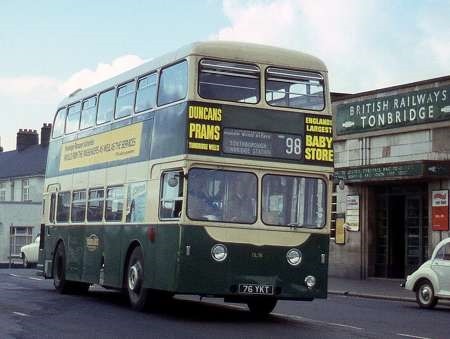 Result: when costs started rising, and finding staff became more difficult, conversion to OPO was the logical move, but H&D were constricted by the lack of suitable buses. Thus the 33 Panthers were an attempt to resolve this problem, but, as Steve says, they were notoriously unreliable. Hearsay claimed that, of the 33 buses, there were always at least 10 off the road. One could, of course, ask why Maidstone & District could release such a large number of buses, most of which were only around 4 years old, but preferred to retain older, underfloor engined, types with similar capacity. For H&D, the answer must have become obvious quite quickly! It is interesting to speculate what the real problems were – the Panther was not universally hated. Sunderland apparently found them satisfactory, and Brisbane had a large fleet, some of which were rebodied at some stage in their lives. Perhaps when you have a large fleet, you have to find a way of making them work. The vehicle in this photo was one of those that went to Wilts & Dorset – as far as I recall the vehicles concerned were S38-40 and S81-110. The first 17 were for Hants & Dorset, and the rest for W&D, but some didn’t enter service with their new owners until after the advent of NBC corporate liveries and the disappearance of the W&D name. A few did receive Tilling red or green (H&D’s version of it), and some ran with H&D or W&D fleetnames on the M&D dark green. There was more than just the one that Pete mentions in Tilling red – JKK 207E ran in Southampton for a while in that condition. I guess it must have been the spring/summer of 1972, and I have an idea that it was quite often used on the evening 47B service to Hursley – usually a crew working! At Winchester our three Metro Scanias were replaced by three of these Panthers, the three London Country Nationals for which the Scanias were swapped were allocated originally to Southampton. So the Panthers had a hard act to follow although I accept the Metro Scanias were not to everyone’s taste. Altogether we had 8 panthers allocated in the mid seventies, including the three ex King Alfred ones. It was rare that more than six were on the road at any one time. 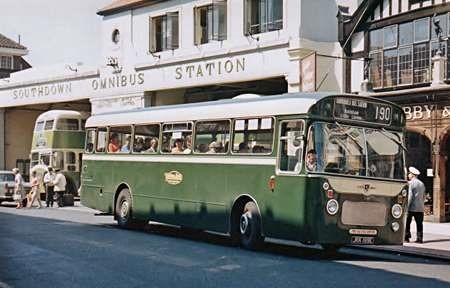 The three ex London Country buses finally arrived at Winchester when most of Southamptons allocation of Nationals were swapped with REs from around the Hants and Wilts depots. Southampton was desperately short of fitters and the Nationals were proving to be almost as challenging as the Panthers were so the powers that be decided to share the problem around! The attached may be of interest. 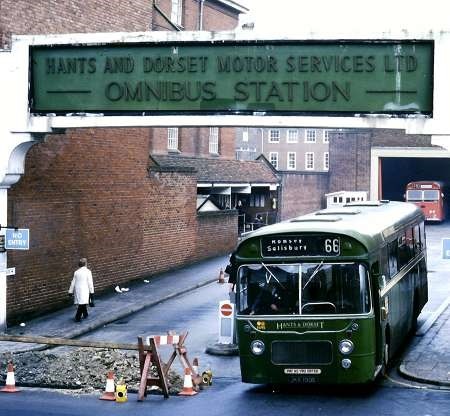 In Hants and Dorset colours JKK190E is leaving Winchester Bus Station in December 1975. Although I have slides of the Panthers taken in Wilts and Dorset colours on routes around Basingstoke, these are at present in store following our recent move. One was often on the 76 to Andover which might explain an evening ride I enjoyed on Basingstoke’s last LL5G !